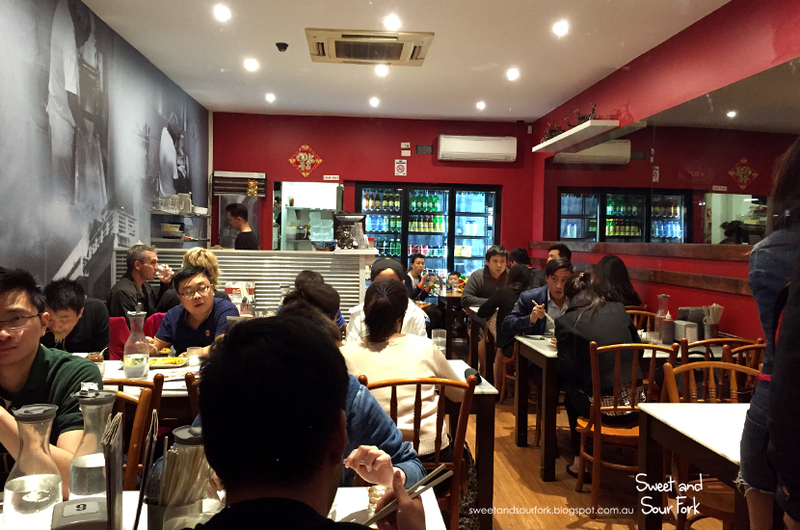 My last weekend passed by in a flash, and come Monday, I was all for not making an effort and blogging one of the dime-a-dozen restaurants along Swanston Street. Whilst waiting for Chris to finish work, I figured there was no harm in taking a look for some good CBD restaurants that I can write about over the next few weeks. It ended in anguish, as I quickly made a dozen or so new discoveries, thus ruining all my plans of being lazy. In the end I did make an effort to keep to my self-made promise of a relaxing blog session, and out of the newly discovered pile, I chose Kitchen Inn for a comforting bowl of noodles. The name of the restaurant rang no bells, despite being located along Elizabeth Street, which I have trekked almost daily for the last 10 years. As it turns out, what I always thought to be a cheap and nasty takeaway shop was actually a Malaysian restaurant, which looked and smelt more enticing than first impressions would lead you to believe. Being a specialist in Malaysian cuisine from the Sarawak region of Malaysia, Kitchen Inn offered not just one, but several noodle dishes I’ve never seen! After some discussion, careful consideration, and lots of at-the-table research, I decided on the Kampua Special ($11, regular), which came with the regular BBQ pork, plus the additions of roast pork and prawns. The curly, springy hand-made noodles were definitely a highlight, and good enough to eat on their own, seasoned with nothing but the fried garlic and shallots in (vegetarians look away now) lard. The other highlight was the salty, fatty roast pork, capped off with toffee-crisp crackling. This may not be health food but like cookie butter, it makes one happily pretend that diabetes isn’t a global epidemic. I clearly haven’t done enough research, because I had no idea what was and wasn’t good beyond the noodles. 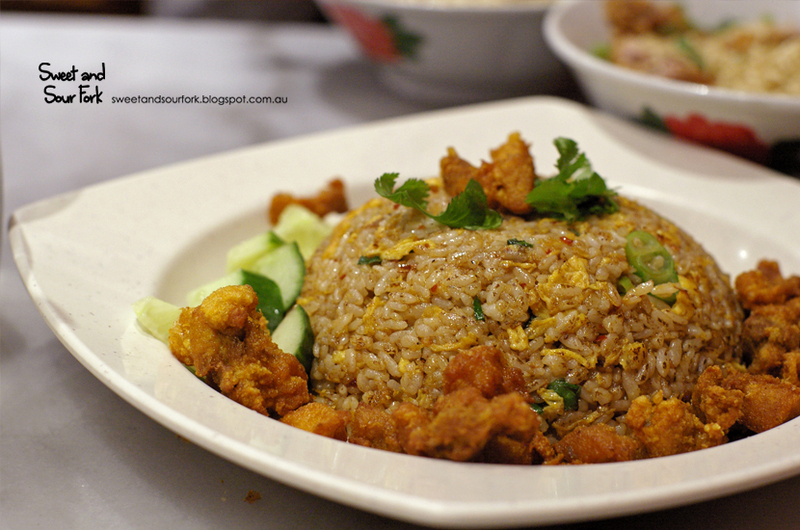 I took a stab in the dark with the Thai Style Fried Rice ($8.5)… and missed majestically. Put simply, it was greasy egg fried rice tossed through with sweet chilli sauce. The fried chicken nubbins weren’t much of an improvement, though their dry crunch did eventually end up winning me over, in a ‘it’s 11pm on a Tuesday I really shouldn’t be microwaving frozen chicken nuggets oh what the hell’ sort of way. Though a bit hit and miss, I can see myself coming back to Kitchen Inn just for their noodles. And maybe in time, I’ll be able to find a few other gems on the menu too. Rating: 12/20 – they’re lard noodles, don’t lie. 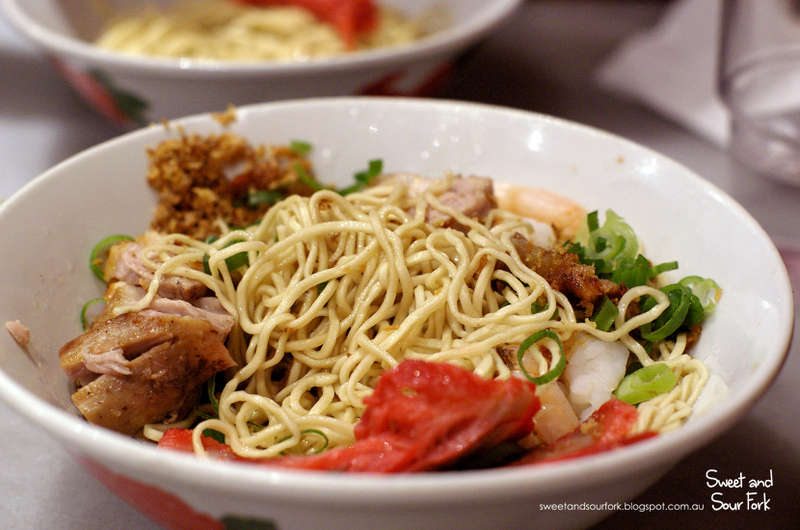 Actually they were more popular with their Sarawak Laksa and the Kolo Mee. 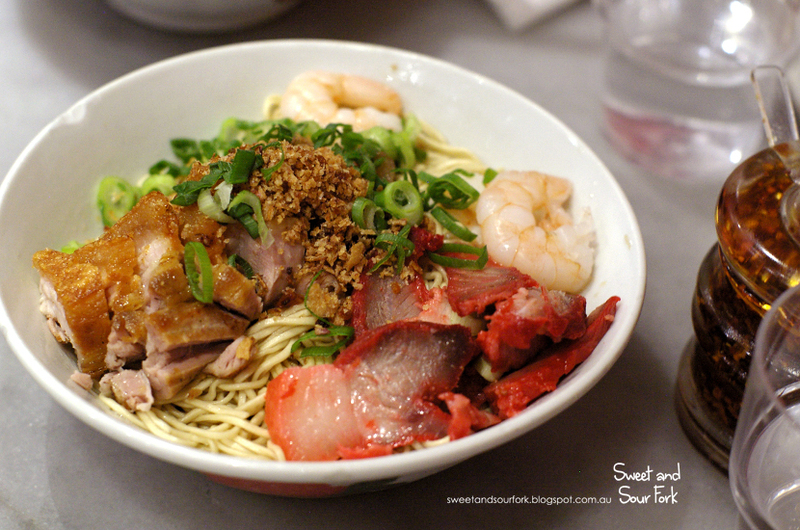 As you mentioned on your blog, their handmade stringy noodle is their pride other than that it's all about lard.